Trump Says He Wants To Help Mediate Israeli-Palestinian Peace Deal : The Two-Way "I've always heard that perhaps the toughest deal to make is the deal between the Israelis and the Palestinians. Let's see if we can prove them wrong," he said alongside Palestinian leader Abbas. President Trump gives a joint statement with Palestinian Authority President Mahmoud Abbas on Wednesday at the White House. President Trump emphasized his commitment to end the long-standing Israeli-Palestinian conflict, saying there's a "very good chance" for a peace deal and vowing to do "whatever is necessary to facilitate the agreement." 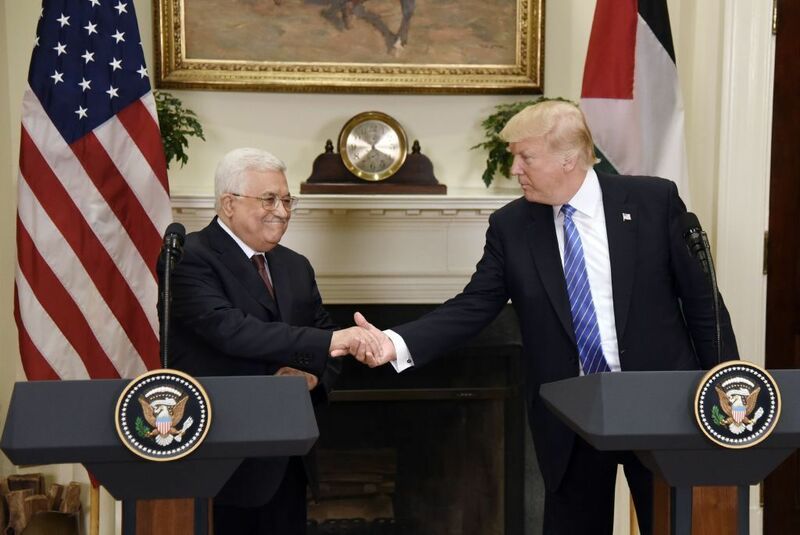 Trump's remarks came in a joint statement following a meeting with Palestinian Authority President Mahmoud Abbas at the White House on Wednesday. "We'll start a process which hopefully will lead to peace," Trump said, standing alongside the Palestinian leader. "Over the course of my lifetime, I've always heard that perhaps the toughest deal to make is the deal between the Israelis and the Palestinians," he added. "Let's see if we can prove them wrong." The Mideast peace progress has been stalled for years. "Now Mr. President, with you we have hope," Abbas told Trump. Abbas said he believed their partnership could bring about a historic peace deal, emphasizing that he wants to see a Palestinian state with borders that existed prior to the region's war in 1967, with East Jerusalem as its capital. "He has not managed to get serious concessions from Israel. Israel continues settlement construction in the West Bank. Palestinians are losing hope in getting an independent country and an end to the Israeli occupation of the West Bank. So Abbas here wants to be able to come home to the West Bank at least showing that he's got Trump's ear." This isn't the first time Trump has signaled willingness to have a hand in peace negotiations, though he emphasized that any agreement must come from the Israelis and Palestinians themselves, and "cannot be imposed by the United States or by any other nation." It won't be easy. "Trust between Israelis and Palestinians right now really is rock bottom," Daniel added. "There is such little belief on both sides that there's a way forward. And so this is Trump's challenge. You know, he wants to broker a peace deal, but there is a danger to orchestrating yet another peace process." That danger was spelled out by veteran U.S. peace negotiator Dennis Ross recently: "What we can't afford is another big initiative that fails because that'll just feed the cynicism and disbelief. And it reduces even more any hope that anything can ever be done." A number of Trump administration officials have strong ties to Israeli leaders, and the White House has appeared to break from longstanding U.S. support of a two-state solution. So far, it has not endorsed a specific plan to push for peace. At a February press conference with Israeli Prime Minister Benjamin Netanyahu, Trump said, "So I'm looking at two-state and one-state — and I like the one that both parties like," he said.